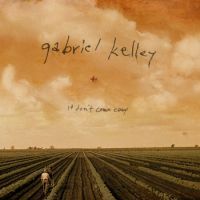 Every year the SummerTyne Americana Festival at Sage Gateshead throws up a star in the making and this year; for me it was singer-songwriter Gabriel Kelley; originally from Athens Georgia but resident in Nashville for several years. Still only 27 Kelley has lived a life well lived; brought up in a wooden shack, moving to Sweden aged 16 then becoming a professional songwriter on Music Row at 21, which he walked away from to work on a music programme for orphans in Guatemala before returning home to live in a van touring the backwaters of America singing his songs to whoever would pay to listen. Which brings us to his debut album, IT DON’T COME EASY, which is the result of a Kickstarter campaign; and threatens to catapult him into the Big Time. Recorded alongside a bunch of friends that are predominantly Ryan Adams’ Cardinals and produced by Grammy Award winning Neal Cappelino the album has a slick, professional sound to it which emphasizes Kelley’s astute stories and lyrics as well as bringing his deep, fulsome voice to the fore. Opening song How Come is wonderfully compelling; full of crashing guitars and swooping strings that laugh in the face of the shoestring nature of the project. With tracks like When Is Enough and These Old Green Hills it’s easy to see why he was picked up at such an early age to be a professional songwriter. Kelley gets under the skin of the people he sings about and the arrangements are as good as anything else I’ve heard come out of Nashville this year. The standout song when I saw Kelley play live was the love song Goodbye Jesse and here it is in all its glory, with a bass that sounds like rolling thunder and a pedal-steel as sharp as a Bowie knife. IT DON’T COME EASY is one of the few albums that transcends genres as it’s a little bit Country, a little bit Folk and a lot of Singer-songwriter fair; plus it sound as good played loud in the car on a sunny day or late at night when feeling sorry for yourself. Trust me……a star is born here.